robot), you need to do the math and add the reduction gearing! Thanks Mark for the detailed calculations, I will follow up on that later. Thanks Russel on the friction, that will go away with two motors/wheels and give a little boost then. You mentioned to consider the requirements, those are easy (at least for my first use case "line follower"). "Asurano" = "Asuro" like robot (see) based on Arduino "Nano"
After much good testing with 12V motor I started testing the 15V motor today. After killing my 3rd and last Arduino Nano had to modify the soldering to work with Arduino Pro Mini. Interestingly the Arduino Pro Mini does not work with 4.18V from LiPo -- the Nano did even work fine with 3.9V. For the motor now 4 LiPos give 16V, and a new connector in the middle gives 8V for Raw input of Arduino Pro Mini. After getting very bumpy run with the wheel already used for the 15V motor I decided to enlarge the diameter of the wheel hole that worked so well before with 12V motor. Result is the same bumpy runs. Next I tried to add weight to counter the bumps (the disconnected battery pack on the middle of the wooden arm), without success. The slowflyer wheels cannot be used with this motor. Wheel bumping starts at 13s and is maximal at 17s. Now have to wait for new wheels for the 12V motor and find alternate wheels for the 15V motor. Today got new wheels with 64mm diameter (compared to 48mm before). LiPos were not fully loaded, only 11.23V compared to >12V. 2nd High speed accident with new 64mm diameter wheel. Wheel got lost at 0:23, wheel hole was too wide for the speed/force. Just before accident 6 rounds in 1.4s gives 4.3rps or 257.1rpm. Wheel moves 1.33m per round giving 5.7m/s or 20.52km/h. Its good to see that like NASA and Spacex, you video your successes and failures, to learn from them. A mean looking line follower, do they have a 1/4mile dragstip event at RobotChallenge? > A mean looking line follower, do they have a 1/4mile dragstip event at RobotChallenge? Probably I would need to go with gearing as proposed (and calculated) by Mark. "Only" 11 rounds with 1.33m per round gives 5.63m/s or 20.26km/h, far less than with 48mm diameter wheel, perhaps because the 64mm wheel adds 2g of weight. Perhaps less diameter wheels can give better results for the 12v motor -- with 6.9m/s maximal speed seen sofar the motor did show 2064rpm at the wheel although it could do 17500rpm. In order to use that wheel with 12V motor axis I had to completely fill the cross with superglue. After more than a day I did drill a small hole with small screwdriver and press motor axis in then. To my surprise there was nearly no imbalance. Video shows the exact same maximum speed as previously achieved with 15V motor and 64mm diameter wheel. This time with smaller diameter wheel (20mm) and 12V motor. 3 LiPos, not fully loaded (11.60V instead of 12.6V). Same speed as maximal speed with 15V motor and 64mm wheels. 15 round in 2.80 seconds is 5.35rps or 321rpm. Wheel moves 1.33m per round, gives 7.125m/s or 25.65km/h. The 12V motor has 17500 rpm at maximal degree of efficiency as mentioned earlier in this thread. Until this last run all tests did show less than 3000 rpm at motor axis. Now I did the math for the last run. 1.33m per round of the wooden stick is 21.1 rotations of 20mm diameter wheel. With 5.35 rounds per second this gives 113.2 rps or 6794 rpm at motor axis. Still not 17500, but much higher than for all previous MTS runs. without gears will never have enough torque for a robot with all but the tiniest wheels. Thanks, the tiny wheels did it. 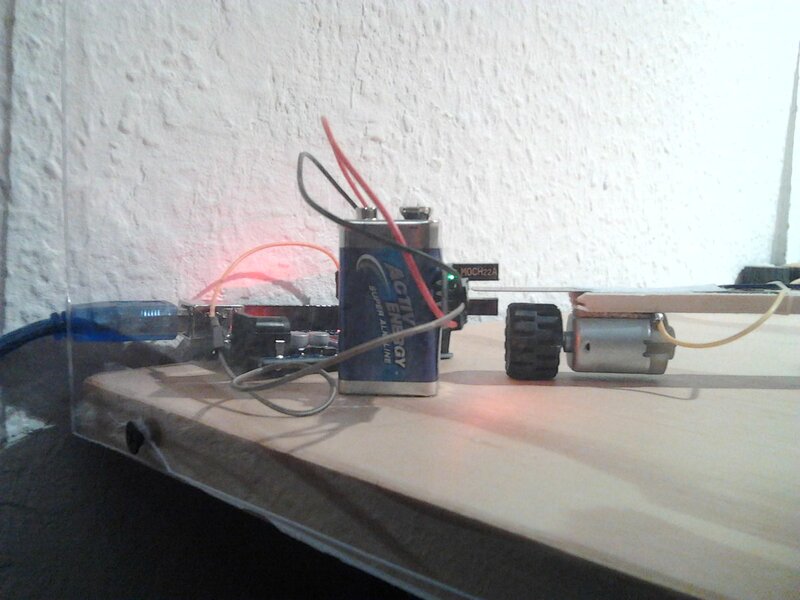 I did build real "robot" now with two motors and two wheels, and it showed 9.89m/s or 35.6km/h !! The whole "robot" two wheels carry the complete weight of 73g, the nail just forces circular movement. It turned out that in previous run only one motor did run. The 2nd was dead due to too hot soldering. Here both motors (bought a new one) did run, and achieved nearly 10m/s or 36km/h ! With new motor, cabling was a problem. This is first run where centrifugal force did not cut any cables. 9.75 rounds in 1.36s gives 7.17rps or 430rpm of wooden stick. Radius of 22cm of wheels wrt nail gives 1.38m per round, ppeed now is 9.89m/s or 35.61km/h (!). Wheel has diameter of 2cm, so with 7.17 rounds of 1.38m this is 157.4rps or 9447rpm at motor shaft (pretty close to data sheet max of 17500 under load). Last comment on Arduino microcontroller, program did increase PMW from 20 to 255 in 12 seconds, keeps at 255 for 10 seconds and then goes back to 20 in 10 seconds before stopping and LED blinking. In order to use this simple program that has been used in so many testruns now, I did duplicate the PWM signal and both motors are controlled by the same L293D motor output. 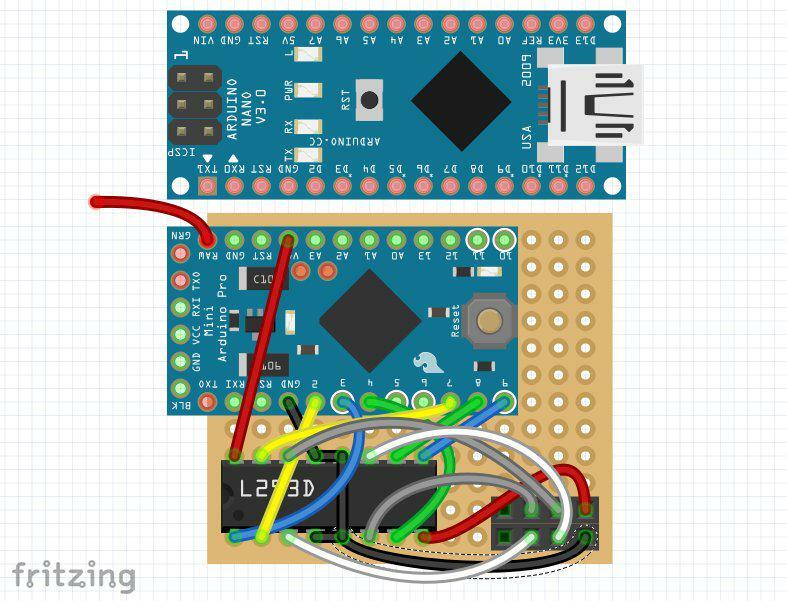 The second L293D motor driver output is not cabled/used yet. Mark was right, torque of 0.00071Nm was good enough for (to me) impressive 9.89m/s or 35.6km/h in motor test station, but may not be enough for autonomous robot (I just ordered 2 motors with 0.0055Nm, a factor of 7.7). Compared to Asuro robot 8 years ago (0.43m/s, 1.2m/s, 1.8m/s) it was quick (3.1m/s or 11.16km/h). But previous runs (same motors and wheels) in Motor Test Station showed 9.89m/s. 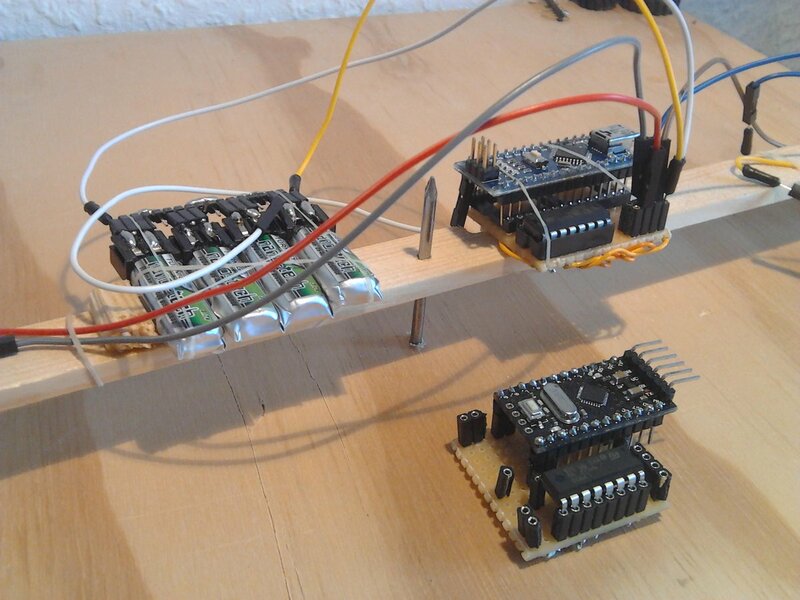 This is first autonomous full speed run of new Arduino robot (3.1m/s or 11.16km/h). 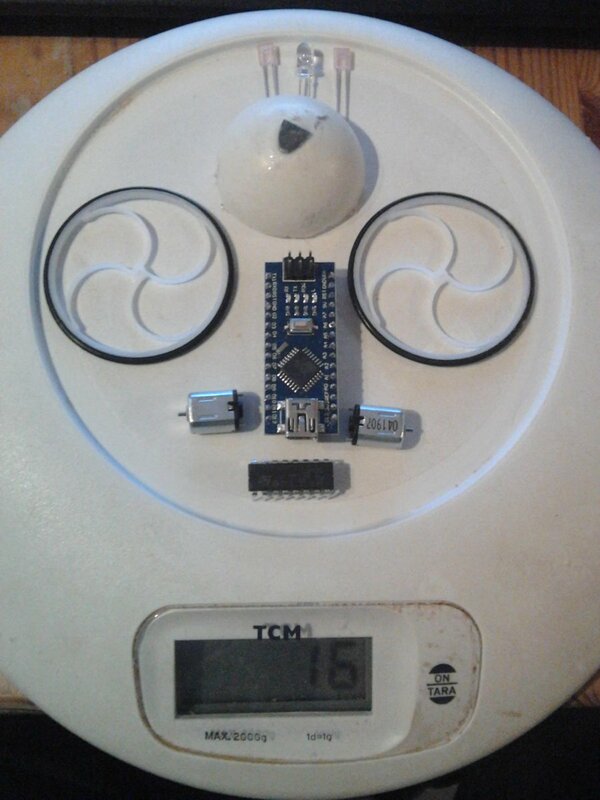 Weight of robot is 96g, and the three LiPos were not fully loaded, but showed 11.41V, the motor is 12V motor. 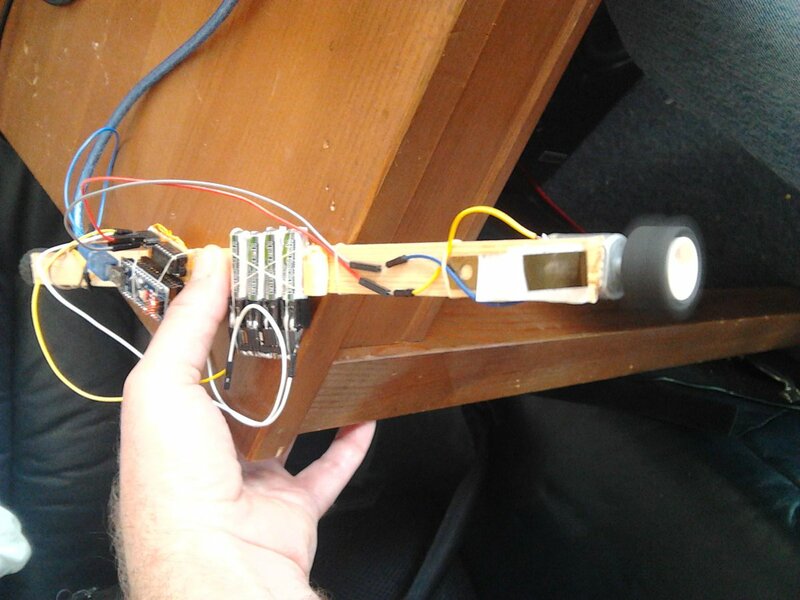 Although pin 13 LED starts to blink when reaching leg of grand piano (indicating that motor has stopped) the kitchen door did a hard stop on the robot. Rowvid.com analysis (7.95s-8.55s) shows that robot did pass 6 floor tiles with edge length 31cm. The speed in that time frame was therefore 1.86/0.6=3.1m/s or 11.16km/h. If I was making that contraption, I'd have the motor stationary and the disk turning. I'd mount the disk ( or use an old LP records ) above the wheel, so the wheel turns it from underneath. And then measure how fast the disk is spinning. > If I was making that contraption, I'd have the motor stationary and the disk turning. I cannot agree here, it is always better to measure "the real thing" if possible. Measuring the real thing sometimes gives surprises (like the 9.89m/s to 3.10m/s drop from MTS to autonomous robot with same motors/wheels). I was quite active this evening, after exploding a L293D by accidently reverse powering, then an MTS Arduino robot accident at >30km/h where the safety glass proved to be a good idea, and finally a new record run with new 14.8V motor (data sheet in this posting, translation of German data sheet terms in this posting) -- 12.3m/s or 44.28km/h(!). 15.26V at start, no accident this time, new speed record. 4 rounds in 0.4s (24.48-24.88) gives 10.0rps or 600.0rpm. A round with this new wooden stick is 1.23m. Speed is therefore 12.30m/s or 44.28km/h. Diameter of wheel is 2cm,. With 12.30m/s this is 195.7rps or 11745.6rpm at motor shaft. When you are using the test jig, the mass that the motor is driving "forward" is less than the mass of the controller and battery because of its position near the pivot point. In your robot the motor is now accelerating the full mass. You are trying to get load /speed figures from circular motion and use them in linear motion. You can use your setup to compare motor characteristics. PS If I had realized way back in this thread what you wanted to do, I'd have advised putting the controller and batteries as close to the motor as possible, so the motor sees the full load of the mass, but figures you obtain would be inaccurate due to circular and linear motion. Thank you Tom for your explanations. They totally make sense and explain what I experienced. The next steps will be to do test runs with arduino and L293D board as well as LiPos sitting directly on top of the motors far off the pivot point. But before doing those tests I did quite some stuff with followup questions. First I did let interrupt service routine (ISR) directly write millis() and count to Serial because I tested such an operation taking roughly a hundreth second and my measurements are expected to be in low 2-digit number range of interrupts per second. Later, in order to avoid timing problems, I just did "A[cnt++]=millis()" in ISR and called a service function printing out the whole array after test completed (I did all using bitlash command shell). The 0 measurements are just some double interrupts at same millisecond, and the one delta measurement of 212ms at 107th interrupt was just a missing interrupt while brazen piece moved through the sensor. All measurements I did were done with the 20mm 1-piece Lego wheels I used until now and the 15V motor. I did find some bigger wheels in the big Lego box from my kids (they are too old to play with it anymore). I was interested in 24mm and 30 mm.